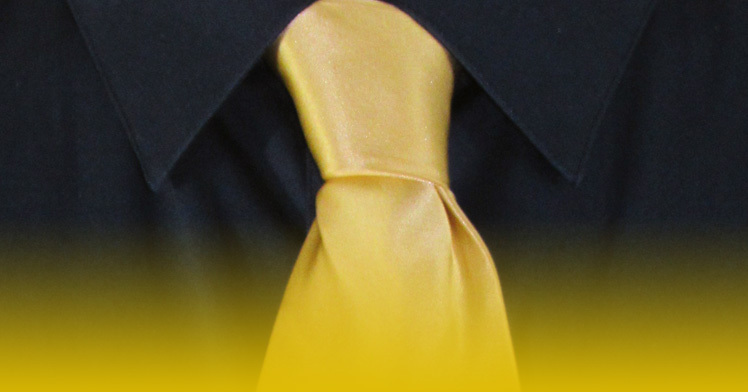 Also commonly known as the Double Windsor or simply the Windsor, the Full-Windsor knot is not actually twice the size of a Half- or Single-Windsor knot. Instead, the Half/Single and Full/Double modifiers refer to the number of times the the is wrapped prior to knotting. 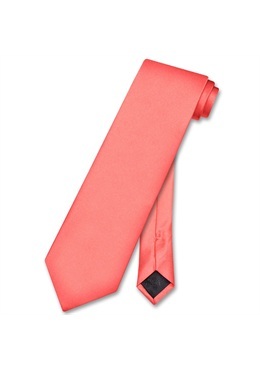 The Full Windsor produces a very full-looking triangular knot which is larger than a Four-in-Hand, although some say that the original Duke of Windsor actually did achieve his eponymous look by using bespoke wide and thick ties with a Four-in-Hand knot. 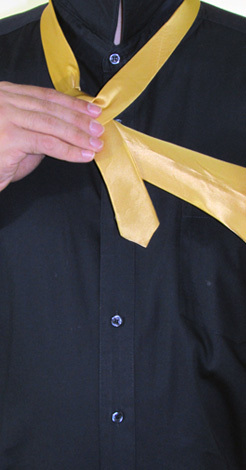 As any brief internet search will reveal, there are a number of different accepted methods for tying the Full Windsor; we find the method described below is easily mastered and comfortably self-releasing. 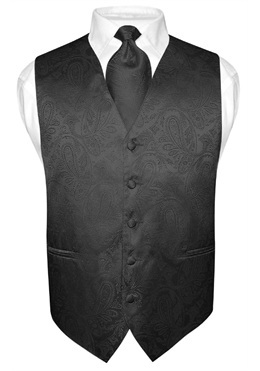 Begin with your shirt buttoned, collar turned up, and drape the tie around your neck with the narrow side on the right. The tip of the narrow side should be roughly level with your navel. 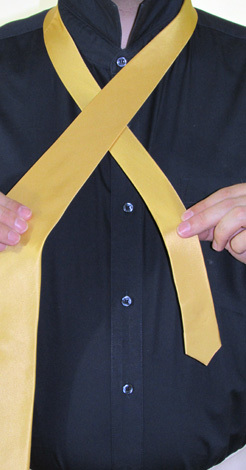 Take the wide end of the tie and bring it across the narrow end as shown. 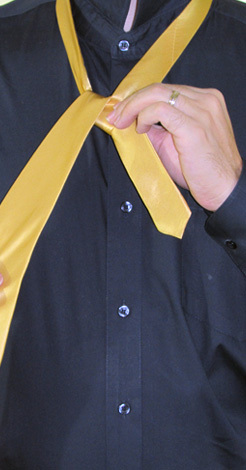 Bring the wide end of the tie back back behind the narrow end and up through the main loop. Bring the wide end down on the same side as before. Pinching the knot to hold the center in place, bring the wide end back behind the narrow end to the other side of your body. Wrap the wide end back across the front of the skinny end, pinching the center to hold the wrap in place. Feed the wide end up through the back of the loop and prepare to come back down through the center of the knot. 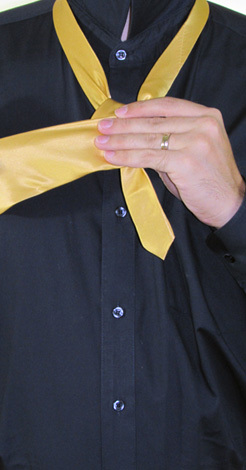 Holding the wrap loosely in place, feed the wide end through the knot and start to tug it down. 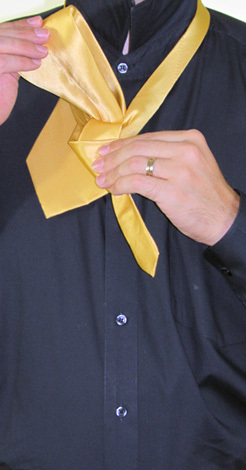 In a simultaneous motion, pinch the knot up and tug the wide end of the tie down to tighten the knot. 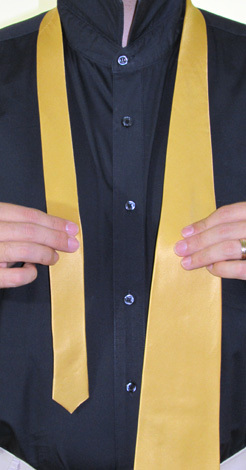 Ideally the tip of the wide end will rest between the top and bottom of your belt buckle. 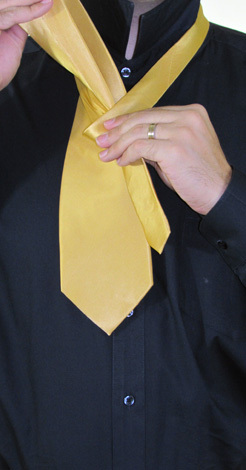 Bring the shirt collar down, smooth it out, and you're done! 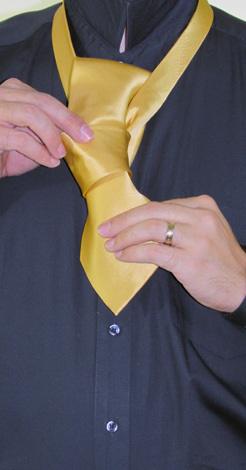 If the tie is too short or too long, tug on the knot to undo it and simply start over. If your first attempt was too long, lengthen the narrow end in Step 1. If your first attempt was too short, shorten the narrow end in Step 1. Want to shop the look? 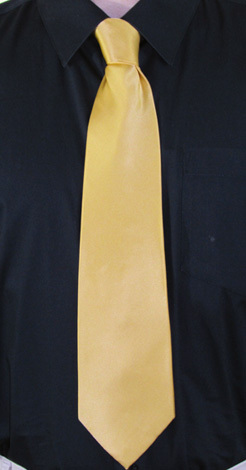 Check out the Biagio Men's 100% Cotton dress shirt in Navy Blue paired with the Biagio Silk Necktie in Gold.